Spice Week – Day 2: Part II. 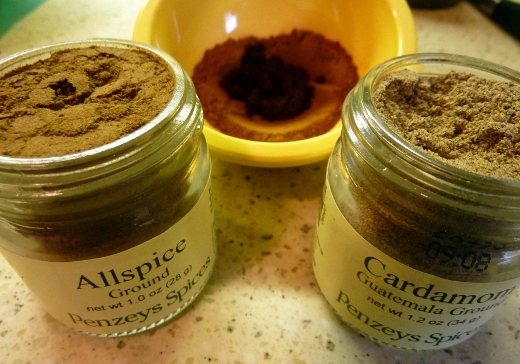 Yes, indeed, that means that I have a bonus post for day two, feature two MORE new spices: Allspice and Cardamom. 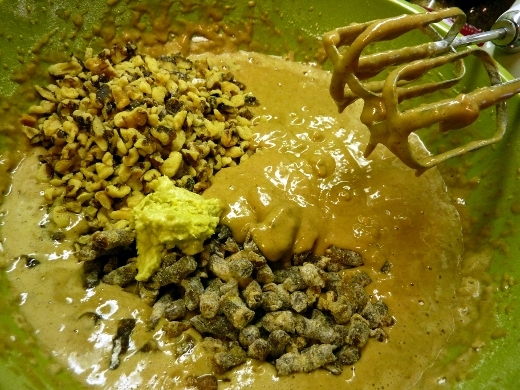 I was a madwoman busy bee in the kitchen today (actually, I was lovin’ it – badabababaa). 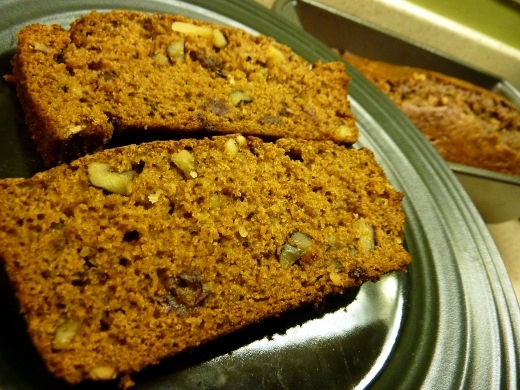 In addition to cooking the Cajun Shrimp Corn Chowder that we had for dinner tonight, I also whipped up a side dish for later this week (which involved 60 minutes of carmelizing onions), as well as two loaves of Banana Nut Ginger Bread, following this recipe. 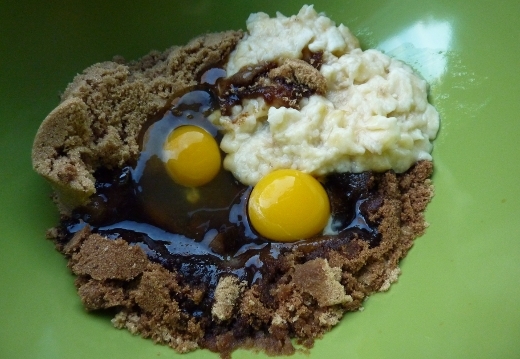 First I used a hand mixer to blend brown sugar, vanilla extract, mashed banana, eggs, and oil together. 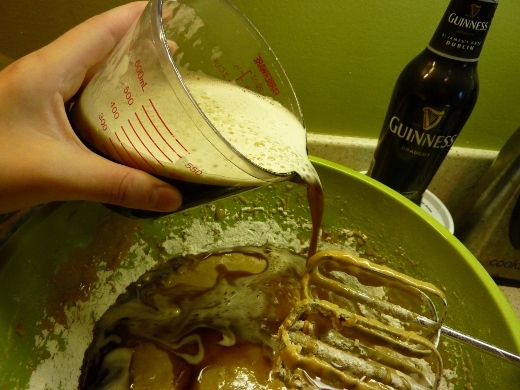 Then it was time for the secret ingredient – Guinness! I’ve become a big Guinness fan in the past year or so. I used about one whole + one third of a bottle of Guinness. By the time the bread was done baking, it was already dark outside, so alas, no natural light for photographing said bread. However, I don’t think this bread would look bad under any light! How yummy does this look? I’ve got two loaves of this stuff. Mmmm and my house smells like ginger bread. Always a plus. The banana flavor is actually quite mild (the fact that my bananas weren’t overly ripe may have contributed to this), and instead the ginger flavor seems to be the star to me, which I love. The heels and first couple pieces in aren’t as moist as one would hope, but the central 2/3 of the bread are dense, moist, and delicious. Actually, the whole thing is pretty tasty, really. 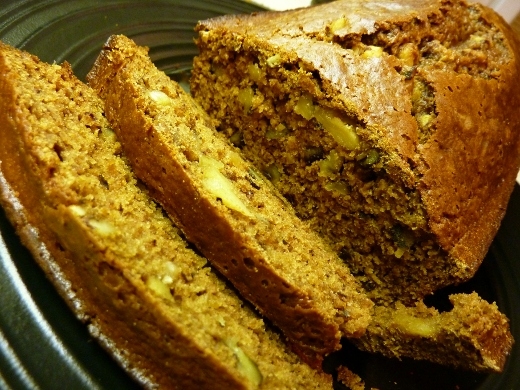 Warm Banana Nut Ginger Bread + shmear of butter + Family Guy + a lil Guinness = Good Sunday Night! ♪♫ Currently listening to: Just Like You – Three Days Grace. UPDATE: WOOOO that cardamom is STRONG the second day! Still good though. 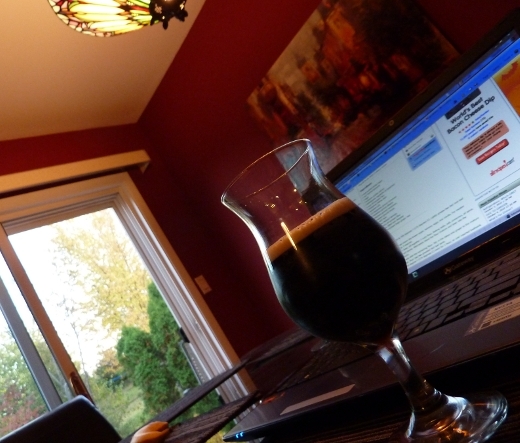 Pingback: Spice Week: Day III – Mujaddara « Meg.Goes.Nom.Nom.